This week, Phil Naranjo, the PM for the dashboarding team here at Tableau, will be hosting a Developer Office Hours: Dashboarding. This will be your opportunity to see what his team has been working on, share feedback, and ask any questions regarding dashboards that you'd like. Do note, his team does not work on formatting - so please limit any questions in regards to that. Have questions to ask before hand or want to share, join the conversation here: Ask us anything about dashboarding! Do you use Tableau Data Server? Let us know! christine kelly asked the question How do I create a waterfall /(flying bricks/bridge) chart ? By working closely with Deepak Rai. they were able to get exactly what Christine was looking for - within an hour! Talk about the value of getting a quick answer in the community! ISO8601 WeekDate rules applied in Tableau was created by none other than Patrick Van Der Hyde, and it's been gaining a lot of traction. This week it had over 20 votes, and though there are some workarounds, it clearly is still relevant. Annabelle Rincon shared My participation to the first european Iron Viz. It is a cute little story of a mouse trying to find the best cheese - check it out! Jonathan Drummey updated Covariance, Trend Lines, Correlation Coefficient R and R-Squared - this living document is a great resource that I'd recommend to see how you can do some more advanced calculations within Tableau. I love this conversation posted by Rowan Davies asking for feedback - This is my first dashboard. What do you think? - Simon Runc and Justin Larson provided some great feedback. This goes to show, you shouldn't be scared to share your work on the community! Last week, Tableau's Ted Wasserman hosted another edition of Developer Office Hours with a theme of Tableau Mobile. Check out his thread if you have any additional questions (you can also find the recording of the event here too): Are you mobilizing? We'd love to hear from you! Stay tuned for an announcement later this week about the next Developer Office Hours - hint, it'll be about behind the scenes with Tableau Server. Did you see the winners of the Iron Viz contest? Congratulations to Joshua Milligan and Timothy Vermeiren! Check out their vizzes here: Iron Viz Geospatial: We Have Our Winners! | Tableau Public And want to see them compete live? Join us in Vegas, October 9-13th. Save $200 with the early bird discount until April 21st. William Wang, a new member to the community, asked a question about How to create pie chart on map that's broken up into different measures? With the help of Michael Hesser, the two of them worked closely to get the answer that William needed through the use of writing calculations and creating table calculations. Glad you got your question answered! Automate subscription based on extract refresh. created by S.R T in January of this year received 13 up votes this past week, giving it a grand total of 18 votes. This idea more than doubled it's score this week! AnhVi Hoang asked a question about a Running Ratio and seems like ran into a table calculation issue that Jim Dehner helped with. The two of them worked together back and forth. Eventually, it looks like it was a LOD expression that Jim came up with that solved the problem. Henry Neira was having an issue with PDF extraction through tabcmd stopped working. All hands were on deck getting him a solution - from Jeff Strauss to Vishal Jethwa to Diego medrano. Brandon Babbitt from Tableau's support team helped find a solution and created a Knowledge Base article out of it to help others who run into it. Nice work community! That's all for this week - until next time - happy analyzing! As always feel free to send any comments, questions, or suggestions for this digest to community@tableau.com. March is nationally recognized as Women's Month, and last week, March 8 was International Women's day. We celebrated by recognizing women throughout the community who have motivated or inspired us in Happy International Women's Day! And don't think you can't still participate, if you have someone you want to recognize, please do! Keep your eye out for more conversations around data and women, or feel free to post your own: Data + Women . Also, don't forget to join us for the first ever Data + Women Virtual Tableau User Group | Tableau Software this Thursday, March 16th at 9:00 AM PDT. Thinking about going to Tableau Conference this year? Want to get a free ticket and share your Tableau story? Apply to speak and join us in Vegas! The deadline is March 31st and it's approaching fast. Check out Apply to share your Tableau story at TC17 | Tableau Software for more information. Do you like using data for good? The Tableau Foundation is helping to support this research challenge, and we encourage you all to get involved - Data For Climate Action Challenge. Congratulations to Michael Hesser who achieved the "Questions for Breakfast" badge which means that he has had at least 25 of his responses marked as correct! Michael only joined the community a little over a year ago - and he's been helping lots of people since he joined. He seems to be particularly good at the calculation questions Thanks for all you do, Michael! We hope to continue seeing you around here. Garrett Shannon a new member to the community and to Tableau had a question Do I need to shape my data? With the help of Deepak Rai, it looks like he was able to get close to the solution he was looking for. Eventually, he used an LOD expression that seemed to get the results he was looking for. Let the community know if you need additional help, Garrett! If not, feel free to mark the answer that solved your problem as correct. Last week, we had a tie for the most voted on ideas. The Ability to Rename Workbooks on Server created by @Michael_Lee back in 2012, received 11 up votes giving it a total of 424 votes. Allowing to set the default value for parameter by Rozvin Marchan also received 11 votes, giving it a score of 403. Both of these are great ideas that hopefully will make their way into the products. Here's a great question created by Sara Lemme about understanding Where's the Data Stored? Lei Chen was able to help answer her question quickly, while Tableau employee, Obed Tsimi, was able to answer all her follow up questions. Kent Marten's Ask us anything about maps or spatial data in Tableau! thread was still the top viewed thread of the week by far. Keep an eye out for the devofficehours tag to keep track of other office hour events and "Ask Me Anything" threads. Vasu choudhury posed a question about Row Level Security - Cartesian Rows and what a thread it turned into! Jamieson Christian went into deep detail about row level security and joins. Not only that, but Jeff Strauss presented a new challenge, and the two of them discovered some new techniques! That's all for this edition of the Community Digest - hope you enjoy the rest of your week! As always feel free to send any comments or questions to community@tableau.com. Happy Monday everyone! We're winding down the last couple days of February and then we're headed into March! Whew! Where have the first two months of this year gone already? March is going to be a great month! It's National Women's month - so we'll be celebrating all the smart women in our community (see below for more). It's St. Patrick's Day in a couple of weeks. I'm in school right now - which means spring break! So many things to look forward to. But let's not get too ahead of ourselves, and let's take a look into what's been going on in the community. And this week, we'll be doing another one with Kent Marten - sign up here: Dev Office Hours: Maps and Spatial Data | Tableau Software Also, let him know the types of questions you'll have ahead of time here: Ask us anything about maps or spatial data in Tableau! As I mentioned above, March is going to be a celebration of the women in our community. We'll be posting content/discussions in the Data + Women group. Feel free to get conversations of your own started! We'll also be having our first ever Data + Women Virtual Tableau User Group | Tableau Software hosted by Brit Cava and Chloe Tseng on March 16th at 9:00 AM. This will be a great event - don't miss it! Jaskaran Dhillon asked How to create a calculated field based on the SUM of a column. Deepak Rai worked with Jaskaran until they found what he needed, which turned out to be the first response. Michael Moore created an idea about how to Add user security to schedules. He created it the first week of January, and just last week it got half of it's votes, putting it at a total of 22. Toby Erkson posted a poll in the community about How do you do SDLC (Software Development Life Cycle) for your Tableau reporting world? Take it and comment if it makes sense to share with the community how you do it! Mikey Michaels asked a question about finding the Current YTD vs Previous YTD. He had some good detailed responses from Stephen Shepperd and Keith Troutt that got him just what he was looking for. That's all for this week (not that there wasn't A LOT more going on). Have a good rest of your week. Until next time, happy analyzing! As always, feel free to reach out to the Tableau Community with any comments, questions, or suggestions. This just posted - a new ambassador spotlight - check out my interview with Jonathan Drummey in Tableau Ambassador Spotlight with Jonathan Drummey. Are you in healthcare or a related field? Don't miss this webinar on February 16th at 12 PM PST - Operational Excellence with Self-Service Analytics | Tableau Software with Tableau's Andy De and austin montgomery from Prominence Advisors. Don't miss this week's Think Data Thursday with Zen Masters, Christopher DeMartini and Tamas Foldi talking about Think Data Thursday - Vizception: D3.JS and Tableau integration - February 16, 2017 - 8:00 AM Pacific. This TDT is meant for all skill levels, so don't hesitate to join! **This is determined by the number of responses to the original thread. Shivang Desai was having an issue where the tabcmd command not recognized as an internal or external command. Madhusudhan Khambham started helping Shivang by giving him information on where to find the command line, etc. However, Shivang was still having issues. Tharashasank Davuluru stepped in by asking for more details and providing Shivang with some screenshots that theoretically should have helped. Shivang, let the community know if this problem is resolved by marking a response as correct or letting us know how you solved it! This thread is a couple of months old, but this question comes up time and time again. Aditya Hrishikesh asked How do we display zero when there is no data ? Several people suggested using the zn function in a calculated field, while others suggested the ifnull function. Additional solutions were also presented, such as making some changes to the data via a SQL statement, etc. There are several solutions to this issue, however, it depends on your data, etc. Being able to share your workbook is extremely helpful in a situation like this! Last week's most voted on idea was Presto Teradata ODBC Connector Timezone Setting with 10 votes, giving it a total of 23 ideas. This idea was created by Nissan N in January. Last week, he also received a response from Tableau developer, Arthur Gyldenege who let Nissan know the Presto connector is actively being worked on. Alexander Mou created and shared this awesome viz about different keyboard shortcuts for Tableau - Visual and Interactive Reference for Keyboard Shortcuts in Viz Talk. So cool!  Yingying Zeng wanted to Remove icon for a pinned access. With the help of Nikunj Bhardava, he showed ho it can be done by fixing the axis instead of "pinning" it. tushar.m had an interesting question about replacing the Postgres Database. He got a couple of responses from Toby Erkson, Jeff Strauss, Matt Coles, and Jonathan that put Tushar's concerns at bay. Happy Monday! It's pretty festive around here with the holidays right around the corner. This time of year is always a good time to reflect, and I have to say - I'm so proud and thankful for being a member of this community. Thank you all for everything you do. We hope you have a wonderful holiday with family and/or friends! First up, the Tableau Community team will be out of the office on Monday, December 26. This means the digest (the last of 2016!) will go out on Tuesday instead. As a reminder, if you're starting a new discussion or asking a question in the Community, and you're able to attach a packaged workbook - please do! It makes it easier for everyone else to help you if they're able to see what you're talking about. Need more information? Check out: Packaged workbooks: when, why, how by Bill Lyons. Shout out to Shinichiro Murakami who is now at the top of the leader board! Shin joined the community early in 2015, and has already made his way to the top. If you don't know Shin, he is one of our Tableau Ambassadors and has been a fabulous addition. Thank you Shin, for all that you do! Patrick Myles reported running into an error: tableau cannot connect to tableau public... It appears that he was not the only one who was having issues. A couple of other people chimed in. Michael Shan, a Tableau Support engineer, jumped in, let the community know that this was an issue that was being tracked, and provided instructions so that the team could collect more information. By the end of the next day, the issue had been fixed for a number of people, and they were able to publish back up to Tableau Public. John Smith was having some major Performance Monitoring issues - it was taking over 17 minutes! He had the attention of Jeff Strauss, Yuri Fal, and Toby Erkson. Though he didn't completely solve the issue, each of them gave him a couple of recommendations. Ultimately, John created a case with the support team, so hopefully, they'll have a solution for him soon! Last week's top voted idea was Control what displays in View Data by Darrin Schulte with 15 up votes. If you're interested in this feature, make a comment, as our development team is actively gathering feedback on it. This is an oldie (well, it's from the spring) that was recently revived. Curved Lines - Never Ending StoryŁukasz Majewski posted the solution with a number of ways of going about it. Yuri Fal also recently posted how it can be done with custom territories. Awesome! Are you trying to connect to a file on SharePoint? Check out this thread Error Publishing Data Connection Which Connects Tableau Server to an Excel File on Sharepoint. In particular, pay attention to David Walker message where he gives more background about WebDAV and some caveats you might want to be aware of. This is a question we don't see everyday posted by Lukas Gächter - Center of grativy (based on distribution data). Jonathan Drummey provided step by step instructions, and got Lukas just what he wanted! For those of us in the United States, it's a short week because it is the US Thanksgiving on Thursday. As a result, I've been thinking about all of the things I'm thankful for in my life, and one of them is this community. We have so many people who are willing to help each other out each day. Everyone is from a different background and has a different perspective, yet we're all brought together by Tableau. I've made some lifelong friends and connections through this community, and I'm hopeful, that many of you can say the same thing. With that - let's take a look into what's been going on. If you made it to TC16, please help us to continue improving Tableau Conference by filling out this survey: Tableau Conference 2016 Feedback. And finally, it's never too early to sign up for next year - back to Vegas, baby for 2017! You may have noticed that the leader board on the front page has not been updating. We are working with our vendor to investigate the issue, and hope to have it fixed asap. In the mean time, Shawn Wallwork always does a fabulous job of calling out people who are doing a good job, and last week was no exception. Shout-out for Shin! Shinichiro Murakami has been helping so many people and teaching others along the way. Thank you for all that you do Shin! johann taljaard asked a question about how to show support tickets by their age and statuses in Help needed with difficult calculated fields. Vincent Baumel was able to help get pretty darn close by working with Johann and some sample data. Together they were able to parse through the requirements and the data. Ultimately, Johann was able to attach the packaged workbook, and Tom W came in with the win using a table calculation to get the view that Johann needed. For the second week in a row, Shawn Wallwork's thread on 10.1 Favorite New Feature? was the most viewed. Tableau 10.1 was a small release with a big impact! If you haven't downloaded it yet, you should. Last week, Subscribe a Tableau Server Group to a View created by Dave Washburn received 16 votes, giving it a total of 25 votes. You may also notice in Ideas, a new stage for an idea called "Planned" and that have a tag of devsonstage. These are ideas that were mentioned in the Devs on Stage keynote at TC16, and will be making it into the Tableau product in the future. You can see all of them here: Planned Ideas. Tableau employee, Chris Beck, has been contributing to the Workbook & Calculation Library with Relevant Value Quick Filters v10.0+ and Currency Conversion with Tableau & Google Sheets. Both are definitely worth a read, and may be something to use in your future Tableau work. Jamison Johnson asked Security of embedded credentials back in October, but thanks to Patrick Van Der Hyde working to clear out the Crow's Nest, he revived it so that it got a whole slew of answers from the likes of Toby Erkson, Russell Christopher, and Justin D'Cruze. Seems like this is a topic people are talking about within their organizations, and a good one to check out. I almost missed this Brainteaser - check out Educational Brain Teaser: Understanding Calcs #1 by Shawn! That's it for this week. For those of you celebrating - happy Thanksgiving, and for those of you who aren't happy analyzing! Good morning, afternoon, and evening to the Tableau Community! I hope you all had a fabulous weekend, and are ready for the week. Mondays can be rough, so hopefully taking a peek into what's been going on in the community over the last week, will help to inspire and motivate you for this week. Let's take a look. There's less than one month left until TC16 in Austin. There's still time to sign up! Check out more information here: Tableau Conference 2016 | Austin, TX | November 7-11 | #data16 Don't miss the chance to meet up with everyone here to finally put a face with a name at the Community Meetup on Tuesday at 2:45 (Learn | Tableau Conference 2016 ). Last week, Mark Wu, Jeff Strauss, and Michael Perillo hosted an amazing Virtual Tableau Administrators meeting. Check it out on the front page of the Server Administration. Just getting started with Tableau and want to know more about the best way to distribute it? Check out 5 Tips for Sharing Data and Dashboards with Tableau | Tableau Software . Congratulations to Andrew Watson who achieved the "Answer Wizard" badge! 100+ of his responses have been marked as correct! That is quite the feat, and speaks to how helpful Andrew has been in helping out this community. Thank you for all that you've done Andrew! Check out the new Tableau Ambassador page: Tableau Ambassadors | Tableau Software! Diego Souza had a question about a Custom calculation Graphical bar. This is an example of Luciano Vasconcelos stepping in to help a fellow community member. There wasn't much to go off of originally, but Luciano was able to get some of the data out of Diego that was needed, and showed how to use an LOD calculation to create what he was looking for. Diego, however, also needed to filter, but was unable to do so using the calculation. Again, Luciano stepped up by creating another calculation that would allow the data to be filtered as desired. When Irina Zholudeva asked How to filter and choose a part of data? I bet she wasn't expecting the number of solutions or detail that this thread generated. This is a great example of a question that has multiple solutions, and the best one depends on any number of things - what's easiest to implement, what the end user should experience, performance, etc. She received answers from kettan, Hima vardhan Reddy Pavuluri, Jonathan Drummey, and Yuri Fal who all presented her with solutions and explanations. Back in 2013, kettan created modifiable reference line tooltip. Looks like there are a couple of workarounds, but still not ideal. This week it received 9 upvotes. You gotta love a good sheet swapping trick! In Action Filter between summary and detailsposted by Ammar Khwaira, he's looking to have a dashboard which allows the user to choose a dimension and see the detailed information based on that selection. Simon Runc showed Ammar this trick - which looks like will solve the original question. The community is a great resource for getting your questions answered, no matter what they might be. Jack May had several questions around HA deployment questions, and was able to get the answers he needed from Mark McGhee and vishwanath Pendyala. Just a reminder that this community is useful for answering other questions that are purely Tableau. Federico Armentano had a question about recommendations on PC FOR LARGE DATA SETS and he got a couple of suggestions that he found helpful. We have so much knowledge in this community - I love it! Have a great week and happy analyzing! Happy Monday to everyone out there! Hope you had a great weekend and are ready to hit the ground running. Let's take a look into what happened last week to (hopefully) help motivate you for your week. For those of you who missed it, the Tableau Zen Masters were announced last week. And what an amazing group! There are 10 new ambassadors, see them all here: Our New 2016-2017 Tableau Zen Masters Are... | Tableau Software And to learn more about the Zen Master program and see the full list, you can always visit: Tableau Zen Masters | Tableau Software. Congratulations to ALL of the new Tableau Zen Masters! Congratulations to Tharashasank Davuluru who achieved the "Question Slayer" badge. That means that he's had 50+ of his responses marked as correct! Tharashasank has been a member of the community since December of last year, and he has constantly been posting to help people. Thanks for all your help! Also, a special shout out to chris.moore.11 and praveen p who have achieved the "I Know Stuff!" badge (10+ of their responses have been marked as correct). Chris joined the community just this past month, in August, and has already made a splash. And Praveen has been a member since 2014, but recently has really started getting active. We hope to continue seeing both of you in the community! Thanks for all your contributions already! Austen Robinson asked a question about the Best way to build this. "This" was a particular table. Ryan Shirley helped by posting a few suggestions, although it looks like Austen is still trying to figure out the best way to accomplish what he is looking for. Let us know what you came up with, Austen! Also, have you tried showing the data in a visual way? Aditya Hrishikesh asked How do we display zero when there is no data ? at the beginning of the month - and boy has it been getting some attention. With over 40 replies, people have been suggesting different calculations, using SQL, and updating the data source to "pad" out the data. Aditya received responses from the likes of Jonathan Drummey, kettan, Andrew Watson, Swarup K, Łukasz Majewski, and several others who went into detail. This thread has several solutions for accomplishing this issue, however, the solution depends on how your data is structured, etc. Hopefully, Aditya was able to solve it, and will let us know what he ended up doing. Julian Kelly created Worksheet 'None' shading should be Transparent. back in October of 2015, and received 10 votes on it this past week, giving it a grand total of 58 up votes. This is a popular request where floating objects on a dashboard should have a transparent background so that you can see whatever is behind it. kettan shared DATEPARSE foreign month names in the The specified item was not found. This is not a request we see everyday - Santiago Calvo asked how to show Only One Row with Border. Michael Hesser provided a solution of using a dual axis - nice work! ravi.gutta had a question about Generate Tableau visualization PDF from a backend application. His requirement is that multiple PDFs be created at once. Jeff Strauss and Tamas Foldi suggested using tabcmd. Tamas even gave a couple additional solutions. Hopefully, Ravi will be able to use one of these! Jim Thompson had a question about Customizing the 'That page could not be accessed', 'Could not enter site' Error Page. Glen Robinson quickly came back with a solution of editing the error.html file. That's all we've got for this week (not that there wasn't a ton more happening!). Have a great rest of your week, and until next time, happy analyzing!! Happy Monday everyone! This week promises good things to come and we're looking towards the end of the summer - already! This week is your last chance to submit a viz for the Tableau Torch contest and win a ticket to Tableau Conference. The feature to highlight is custom territories and the theme is "Her name is Rio." So all you map gurus - get to work and let's see you submissions! Stephen Lynch asked was having some issues getting Tableau to recognize Formatting Date Time from an Excel file. Mark Fraser, corey levinson, and kettan helped to troubleshoot the issue. Though Stephen still hasn't quite figured out the cause as to why Tableau keeps turning the date time into a string, he was able to figure out that case matters when using the dateparse function! Takeaway: "mmm" won't be recognized, it needs to be "MMM." Thanks to William Bohn and the community for bringing Publish Failure - Error Reading Archive File to our attention. Our devs have jumped on the issue and are working through solving it. The fix they had in place took longer than expected. They should have an update on this later today. In the meantime, if you run into the issue, please share the requested information (text of error message, size of extract, connection type, and version/what you published from) in a support case. Last October, Alex Van Boxel created REST API: Refresh datasource extract from source (v. 11.0). This week it received 17 upvotes - giving it a total of 35. That's more than half it's votes! I think it's a great idea - thank you for sharing it Alex. Manu Mohan C asked How can i use a unique-concatenate aggregation to a string field? He got several answers, but one detailed answer that is worth noting is Jonathan Drummey's detailed response. You'll want to bookmark this one. Narender Kanuganti had a general question about Tableau Monitoring and Backup Recovery. Jeff Strauss gave his answer, and linked to the first post of his blog: Enterprise automated monitoring. Thanks for sharing! That's a wrap for this week! Have a good one and until next time - happy analyzing!! Congratulations to John Sobczak who received the "Question Slayer" badge - meaning that 50+ of his responses have been marked as correct! John has been a member of the community since 2012, and has been helping people with concise, step by step instructions on solving their questions. Thank you for everything you do, John! Morgan DUARTE asked a question to find the Delta Price calculation between sale prices for two given years. Ashish Chaudhari and Mahfooj Khan provided a couple of calculations that got close, but didn't quite solve the problem. Mark Fraser then came in with some insight about there being multiple records for each data. This helped move the ball a little closer to the finish line, and helped Morgan on his way. himhim chan asked how to Calculate time difference with certain time range. Himhim received a series of possible solutions, with multiple calculations that broke it down into multiple segments. Ultimately, it was Łukasz Majewski who had the correct answer which solved Himhim's problem. Sean Mullane's idea to Allow Incremental Refresh to Modify Rows received 12 votes last week, giving it a total of 157 upvotes. Here's a post that was started back in March of 2014, but was revived when kota spandana asked a follow up - Re: Custom Number Format. Several of our ambassadors jumped in, and gave some new, solutions - including Shawn Wallwork, Simon Runc, Yuri Fal, and kettan. 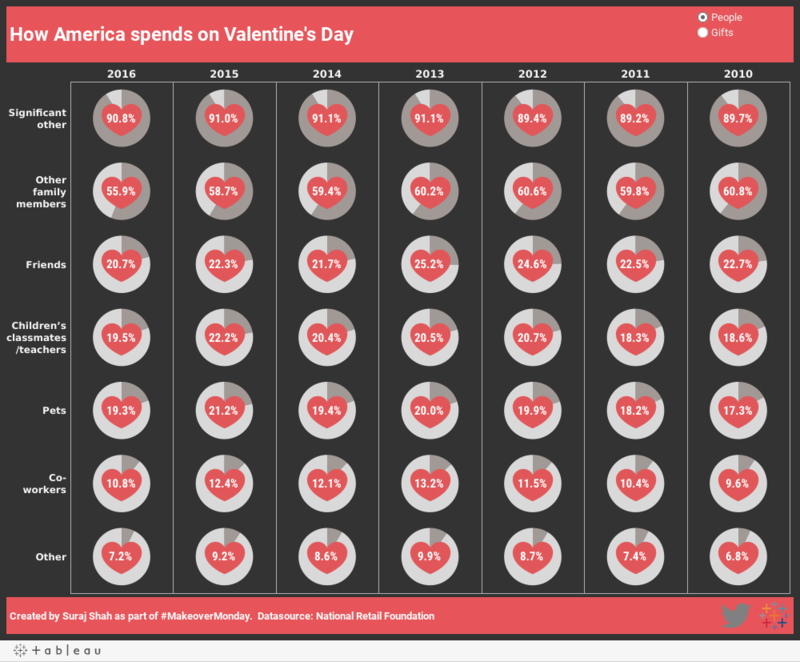 Ryan Rowland took advantage of getting some feedback on his viz in Viz Talk - Review/Critique my Latest Tableau Public Dashboard. 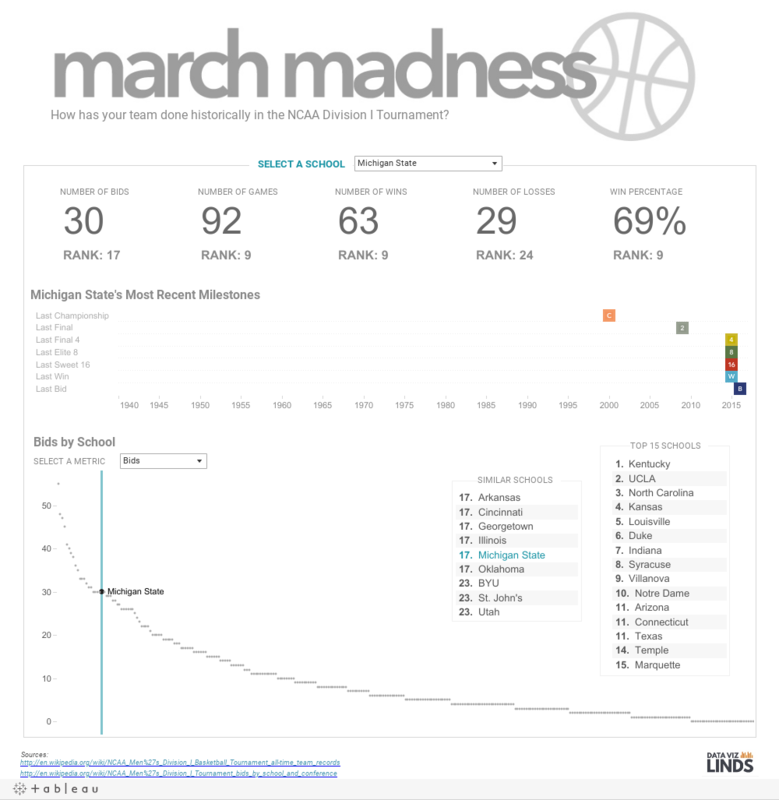 He actually ended up winning on Tableau Public's "Viz of the Day". Love seeing the community being used for these types of conversations! If you've never seen Toby Erkson's Server admin reports for workbooks, data connections, data sources, and their schedules - you'll want to check it out. He consistently keeps it up to date with things that he's updated or with the latest versions of Tableau. Check out the back and forth conversation between a new to Tableau user, Mark Worthen and Rahul Upadhye who worked on creating a Time to Break Even chart. That's it for today, everyone (though, there were plenty more examples of people helping each other and solving problems)! Hope you have a great week and until next time, happy analyzing! Did you watch the Tableau 10 Virtual User Group? If you missed it, you can still check it out here: Tableau 10 Virtual User Group on Livestream. It was a great event with a Pre-show hosted by three Tableau Ambassadors and User Group Leaders, Amber Smart, Christopher Scott, and Emily Kund. The main event went into a deep dive of the Tableau 10 features with the Tableau Developers - so much goodness, coming! This was also the kick off of the Tableau Torch and the Tableau Torch Viz Contest! The Tableau Torch Viz Contest is definitely something you'll want to partake in. There are 5 opportunities to win a ticket to TC in Austin and create a Tableau viz using Tableau 10. Congratulations to Ashish Chaudhari on receiving the "Questions for Breakfast!" badge - meaning that 25+ of his responses have been marked as correct. Ashish has been a member of the community since 2015, but has recently been getting really involved! Thank you for all the answers you've given to people to make them successful! We hope to continue seeing you in the community! Allen Gapara had a question about Automatically Select a parent by selecting a child earlier this month. Ivan Young suggested using a parameter instead of using a calculation or LOD expression. He created the workbook in version 9.2 to solve Allen's issue, but when Allen didn't have that version - Ivan gave detailed instructions on how to accomplish it. What a great community! This one has been on the top list a couple of weeks now. Created by Loic Grange back in 2012, https://community.tableau.com/ideas/1313 received 12 up votes, giving it a grand total of 901 votes in favor of it. Dual Axis Maps are one of my favorite visualizations to create in Tableau. Christopher McKinnish was having a little trouble, getting his to work as expected - it was no longer being recognized as a map. Mahfooj Khan explained how to get it working appropriately by showing him the different marks cards. Parameshwar Singireddy sharedsplitting String First and Last Names. Always love seeing people contributing to the The specified item was not found.! One thing Simon Runc noted, is that this can be accomplished a couple of different ways. Thank you Shawn Wallwork for calling out people add an avatar in Protest ended.... So great seeing more and more people giving us a glimpse into who they are! That's it for this week! Hope everyone has a good next couple of days. Happy first day of summer to the northern hemisphere (and first day of winter to the southern)! The summer is shaping up to be busy one as usual, and this week is no exception! Let's take a look into what's up for this week and what happened last week. Here we go! First things first, this week is the Tableau 10 Virtual User Group. Not sure what that is? Learn more about the hosts here and register here to watch the event live or see if there is an on-site viewing party in your area! This is going to be a fantastic event where you will get a deep dive into the Tableau 10 features, have the opportunity to win a pass to TC16, and ask questions of the Tableau Devs who have been working on the latest release. Feel free to ask your questions ahead of time here: Tableau 10 VTUG - Q+A or tweet out on the day of the event using #TableauVTUG. How long have you been using Tableau? Let us know in this poll! Have you seen this blog post (Best Practices for Designing Efficient Tableau Workbooks, the V10.0 edition | The Last Data Bender) by Alan Eldridge? Alan put a lot of research and time into it - definitely recommend checking it out! All entries for the Web Data Connector Hackathon should have been submitted at this point. Looking forward to seeing what the winning submission will be! Congratulations to Tina Hauser who achieved the "I Know Stuff!" badge - meaning that 10 or more of her answers have been marked as correct. Tina has been a member of the community since 2014, but has recently become very active - taking on questions related to how to write calculations. Thanks for your contributions to the community, Tina, and we hope to continue seeing you! This week, Vivek Nallapaneni (a brand new member of the community) asked how to find the Aggregate Top N measures per Player. Paul Sherras took a stab at this using the Index function, but it wasn't quite what the outcome needed to be, as Ashish Chaudhari noted. Looks like Ivan Young came the closest to solving the issue by using several table calculations. Vivek, does this solve your question? If so, please mark it as correct! Allen Gapara was having an issue with Automatically Select a parent by selecting a child where the numbers weren't filtering as expected. Ivan Young to the rescue again. He recreated the workbook using a parameter to help solve Allen's issue. Nice work, Ivan! This week's top voted idea with 10 votes was written by kettan back in 2013 (but has been updated a couple of times) - Hierarchy Filter. This would allow for multiple fields to be used in a filter to allow further filtering. I like this idea - up vote from me! The title of this post is what caught my eye Help me Obi-Wan Kanobi, you're my only hope! Calling for a Jedi to help tweak the appearance of my bubble charts. I've… posted by Michelle Barrineau. She was working on a report for her executives who wanted to show 3-D looking marks on her view. Toby Erkson had some fun with this and mentioned 3D as being a part of the Darkside... He also helped explain some of what it means to be a data analyst. Ultimately, Simon Runc helped solve the original question using a dual axis and overlaying different shapes - quite clever! fauziajalali.jalali asked a question about Viewing Tableau 9 Background Tasks Queued. Tableau Admin guru, Jeff Strauss quickly answered the question and got Zee on his way! That's it for the Digest today - hope everyone has a great week, and an even better summer (or winter)! Happy Monday, happy May! Spring has come in this part of the world, and I've got to say getting out of bed in the morning when the sun is shining is much easier. I still need my coffee though - grab your cup of joe or a snack, and let's a take a peak into the Tableau Community. In case you missed it, Pooja Gandhi has the Ambassador Spotlight on her. Pooja was such a blast to talk with - she's as friendly in person and on the phone as she is on the forums! To see our interview, read Tableau Ambassador Spotlight - Pooja Gandhi. Did you see the Announcing: Developer Office Hours for Web Data Connector? If not, the recording is on that thread. The Dev Office hours are becoming a big hit. If you have other topics you'd like to have covered by a Tableau Developer, just let us know and we'll try to make it happen! Tableau's own Matt Coles achieved the "Question Slayer" badge - meaning that he's had 50+ of his responses marked as correct. You know Matt from his work in the Server Admin area, and in particular for his work in developing VizAlerts. Thank you for all the work you do in this community, Matt! Additionally, kumar.c has received the "I Know Stuff!" badge (10+ of his responses were marked as correct). Kumar has been a member of the community since 2014, but has recently become more active. Great to see you back, Kumar! Shivang Desai asked a question about Getting total sales in tableau for all order numbers that have order number same as beverages. Shivang received a lot of help. Adam Crahen gave him a solution that worked with 9.0 and above, however, it was soon discovered Shivang only had 8.3. Ashish Chaudhari, Tharashasank Davuluru, and Tableau kumar were able to help quite a bit. But, another issue appeared when Shivang went to add a grand total. Shivang, if you're able to upgrade to 9.0+, that would solve both your issues. If not, you may need to combine two sheets together on a dashboard. Hopefully, you've found a solution - if so, please mark the answer that solved it! Andrew Pick was hitting a csv legacy connection row limit. He needed to use the legacy connection because he was using CustomSQL. One of Tableau Senior Software Engineers, Dmitry Chirkov, saw the thread, and was interested because he'd never seen this behavior before. Andrew did a little more digging and discovered it has more to do with the columns than the number of rows. It still sounded a little odd. Cristian Vasile suggested he try a transformation/analysis tool that would allow Andrew to get the data he needed directly into a .tde file. This one has been a top voted idea a couple of times recently. Shawn Wallwork created https://community.tableau.com/ideas/5655 at the end of last year, and now it has a grand total of 187 up votes. Fingers crossed we get this one included soon! Have you tried out the SPLIT() function when you need to break up a string? Shawn Wallwork solved James Diza's Create datetime out of string without dateparse on live connectionissue using this solution - making it much easier and elegant to work with. Amber Loranger posted Slow Queries to Stored Procedures on MS SQL Serverto show instructions on ways to avoid this in the TabWiki. Are LOD calculations easy? You be the judge, and take on timothy rafferty's Another 'easy' LOD question.. or is it ? He got quite a few people to chime in, coming up with different solutions, with different end results. How to fill areas defined by 3-digit zip codes posted by Chris Wells generated some interest from the community (including some Tableau employees). Adam Crahen gave a solution that blended some lat/long data. However, Kent Marten showed that this will be done much more easily in 10.0 - so sign up for the beta!